One of the most bizarre attractions in northern California, the Winchester Mystery House was the residence of Sarah Winchester, widow of the inventor of the famous rifle. The house was continuously under construction for nearly 40 years, and it is popularly believed to be haunted by the spirits of people killed by Winchester rifles, who drove her to keep adding and remodeling the mansion. Whether or not it is haunted, the house is a strange and rambling collection of roughly 160 rooms, including 40 bedrooms, two ballrooms, 47 fireplaces and several secret passageways. Seemingly innocent doors and stairways lead nowhere, and there are superstitious touches including a preoccupation with the number 13, and recurring spiderweb motifs. 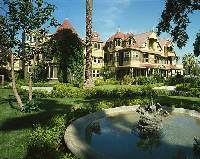 Tours of the Winchester Mystery House take roughly 1 hour and are offered daily. Special flashlight tours are offered every Halloween and on Friday the 13th. Children are not allowed on 'Behind the Scenes' and Grand Tours for safety reasons. Opening times: Opening time is 9am year round, while closing time depends on the season and day of week. Check website for details. Admission: Mansion tours start at $39 for adults, and $20 for children under 12.